"Solar Urbana-Champaign" streamlines process, reduces price for renewable energy. I’ve got a confession to make. I’m sometimes very, very slow to act on my good intentions--especially when my good intentions involve home improvement. To wit. In the past, I’ve written about projects by local people to reduce or eliminate the need for fossil fuel at home through combinations of efficiency, conservation and solar power. I’ve sung the praises of new homes, such as the passive houses built in Urbana by the Ecological Construction Laboratory, and the Equinox House, where Ty and Deb Newell enjoy a solar powered retirement. 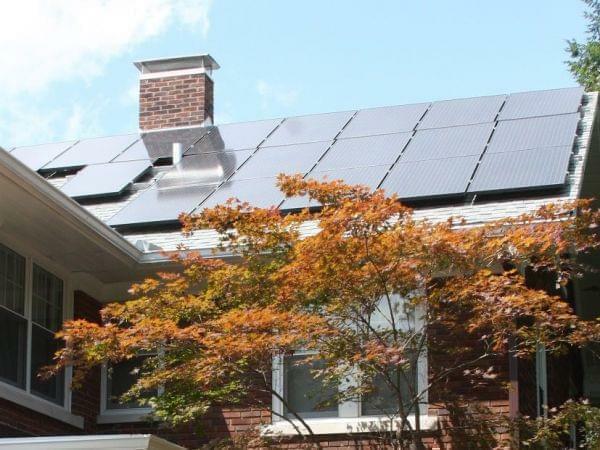 I’ve celebrated retrofit projects, too, like Phil Krein’s DIY solar installation, and Scott Willenbrock’s net-zero-energy retrofit of his family’s 1929 colonial-style house in Champaign. But I’ve taken only a few steps on this path myself: mostly small ones, like investing in energy efficient lighting and appliances, along with one slightly bigger one, hiring an energy performance contractor to improve the weather sealing and insulation of my house. And really, that’s like having the holes in your pockets mended so you stop losing money through them—who wouldn’t? I’ve hesitated in the process of taking two other big steps, though. One is to replace an aging—okay, ancient—furnace, as well as a slightly younger air-conditioner. I’ve gotten an estimate for that, so progress. The other is to install a solar system on the roof. That’s going to happen in 2016, though, thanks to a program that makes solar power straightforward and economical. It’s called “Solar Urbana-Champaign,” and it’s available for homes, farms and small businesses in Champaign County. The program is an outgrowth of the City of Urbana’s Climate Action Plan and it’s sponsored by the City, the Midwest Renewable Energy Association, Illinois Green Economy Network and the Environmental Law and Policy Center. It secures a big discount in the price for rooftop solar by bringing consumers together to buy as a group from a contractor selected through a competitive bidding process. In this case a St. Louis company, StraightUp Solar, was chosen, and they’re partnering on the work with the local company, New Prairie Construction. How much of a discount are we talking about here? It’s difficult to quantify across the board, but the price I’m looking at is about 30 percent lower than an estimate I got for the same system last summer. And it’s more than low enough to be offset by the value of the electricity the panels produce while they’re still under warranty. The feasibility and cost of rooftop solar varies according to a number of factors, including the age and exposure of the roof in question, shading, etc., so the best way to know whether it makes sense for you is to get a site assessment. And even before that, people interested in “Solar Urbana-Champaign” are encouraged to attend one of the information sessions that are being held by program sponsors. You can see a schedule for those sessions below. And, please, rest assured I have no personal stake in “Solar Urbana-Champaign.” I’m excited about it because it makes the choice to act on my good intentions so easy.